Extreme Exorcism takes a unique concept and doesn’t really expand on it, but this one concept doesn’t overstay its welcome. The main mechanic of enemies mimicking your previous moves is interesting, and although it is just one concept, there is a surprising amount of depth that comes with it. Extreme Exorcism’s main draw is that your enemies mimic your previous movements through an increasing number of rounds. It is simple in the early rounds, as there are only a few enemies to keep track of that are mimicking your movements. In later rounds, with crazy amounts of mimicked ghosts, it can be pretty challenging to keep track of what moves everyone will make. In each stage you are given three lives, and once they run out, that is your score. To proceed to each new round, you must take out your previous round’s ghost. This ghost wears a crown on his head and once that ghost is eliminated, the next round begins. The other ghosts are also around mimicking the previous moves you’ve made so far. A plethora of weapons are at your disposal to eradicate each of the ghosts. Knives, guns, boomerangs and more are available. These weapons will randomly spawn in the level, and you can carry up to three at a time. 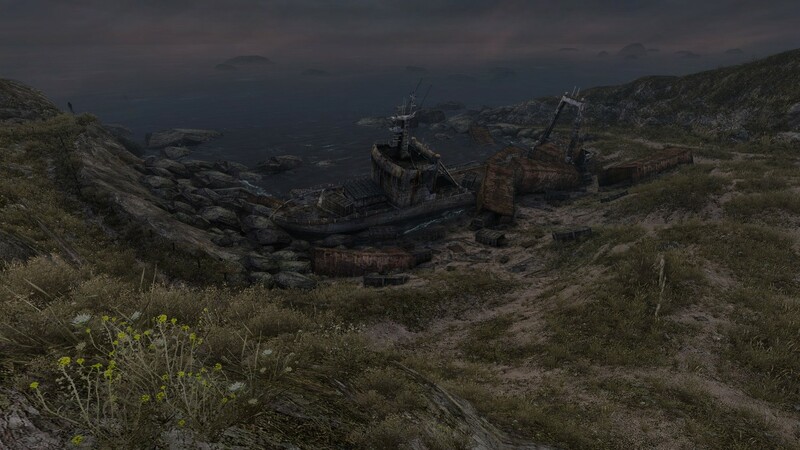 At times these weapons can spawn in random numbers, but at times you will begin a new round and no weapons will be available to use, leaving you vulnerable. If you don’t grab a weapon quickly when the round starts, it’s rare you see the next round. The weapons are fun to use, and some are better than others. When you see your favorite weapon appear on the screen, be weary of how much you use it, as you’ll need to fight against it the next round. Very quickly you’ll learn to not spam your shots, as it’ll be hard to dodge them in the following rounds. 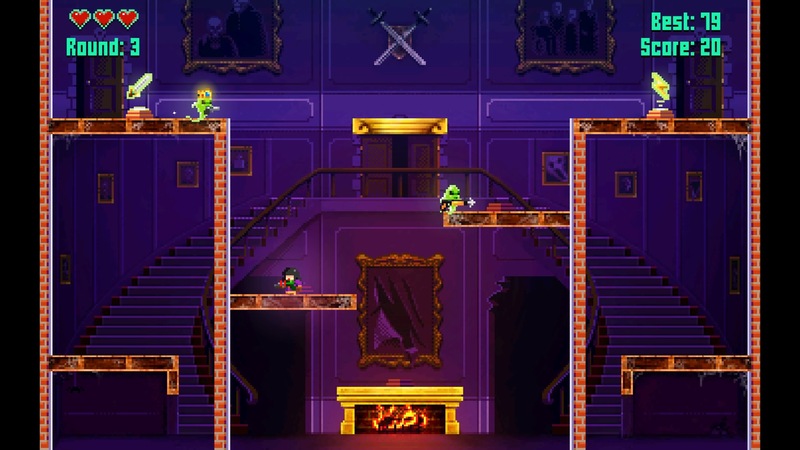 In each section of the house there are five levels, and there are ten sections of the house, meaning there are plenty of stages to get through in the arcade mode. It took me a few days to get through each section, especially when you need to reach a certain score to proceed and unlock new weapons. The arcade mode can be played single player, or in offline co-op with up to four players. Playing in co-op is fun. Especially with all of the mayhem that is on screen. After the Arcade mode is complete, the Challenge mode will keep you occupied for quite some time. Extreme Exorcism offers 50 different challenges, such as surviving a certain number of rounds, or defeating number of ghosts with a particular weapon. These challenges are tough, and will test how good you are in Extreme Exorcism. Finally, the Deathmatch mode is a local multiplayer in which you’ll battle your friends in numerous presets that change the match. Deathmatch is a fun diversion, but you’ll most likely want to have your friends aid you in the Arcade mode. At the end of the day, Extreme Exorcism has a wealthy amount of content for players who want to complete everything. The Arcade mode will have you chasing scores on the leaderboards to see who can post the best scores. The game has a pixelated art style that showcases the ghouls, characters, weapons and environments to great effect. Each stage and section of the house looks great. The music in the game is really outstanding. There are a handful of tunes that put you in the ghost murdering spirit. All of the sound effects and little songs that play evoke an atmosphere that you would find in an arcade. If I walked into an arcade, and heard the music of this game in the corner, I’d definitely want to walk up and play. Extreme Exorcism is a pleasant surprise and a very welcome addition to the local multiplayer revival. The game is played ideally with friends, but it is even enjoyable as a single player. Going for personal bests on the leaderboards and going through each of the 50 challenges should have you occupied for quite some time. If you are looking for a great local co-op game, this may be what you are looking for.